The Sutter Buttes (Maidu: Histum Yani or Esto Yamani, Wintun: Olonai-Tol) are a small circular complex of eroded volcanic lava domes which rise as buttes above the flat plains of the Sacramento Valley in Sutter County, Northern California. They are situated just outside Yuba City in the northern part of the state's Central Valley. Referred to as the world's smallest mountain range, Sutter Buttes has as its highest point the summit of South Butte, at 2122+ feet (647+ m), which is also the highest point in Sutter County. At the base of the mountain is the small town of Sutter. Both the town and the buttes are named for John Sutter, who received a large land grant in the area from the Mexican government. The small range forms a rough circle approximately 10 miles (16 km) from north to south and east to west. The Sutter Buttes lie within the Great Valley of California. They were formed about 1.6 million years ago in the early Pleistocene Epoch by volcanic activity. They are the remnants of a volcano that has been dormant for about 1.4 million years. 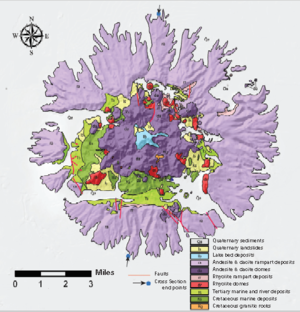 Some geological references suggest that the volcano represents the southernmost boundary of the Cascade Volcanoes, but there are significant differences in age and form compared to the other volcanoes in that range. 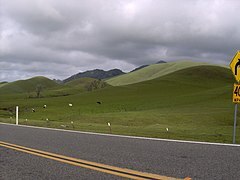 Others suggest that its age places it with the volcanic elements of the California Coast Ranges; its composition is closer to that range but does have significant differences. The volcano is believed to have erupted along a now inactive fault line. Geologists also believe it is the largest example of sedimentary material that’s been uplifted by volcanic activity. Exploration of natural gas leaks was first undertaken at South Butte by Dexter Cook in 1864, when he dug a 65-foot shaft. Sutter Buttes Oil Company drilled a well in 1927 to a depth of 2,900 feet, and other wells were drilled on the western margin. Buttes Oilfields, Inc., drilled a well in 1932, but it wasn't until June 1935 though that it drilled the first of four gas wells in the area of T. 15 N., R 1 E.
The rugged central part of the Buttes has a stony, brown sandy loam of variable depth and good-to-somewhat-excessive drainage. The smoother perimeter has more variable soil, with clay or silt loam areas among the sandy loams. These soils support grassland or oak woodland. The Sutter Buttes contain many species of flora and fauna. Wildflowers are represented by numerous taxa; included in these many wildflowers is the yellow mariposa lily, Calochortus luteus. The Sutter Buttes figure prominently in the creation stories and other traditions of the indigenous Maidu and Wintun peoples. The Nisenan Maidu lived on the East side of the Buttes, while the Patwin Wintun lived on the West side. The Maidu name for the Sutter Buttes is Histum Yani (middle mountains of the Valley) or Esto Yamani, while the Wintun name for the Sutter Buttes is Onolai-Tol. All of these names roughly mean "The Middle Mountains". While there were only seasonal encampments in the buttes, both of these tribes visited the buttes regularly to gather acorns and other foods or to hunt game. The Buttes were also a center of regional Native American religion. According to anthropologist Alfred Kroeber, the Patwin village where the city of Colusa now stands was the “hotbed” where the Kuksu Cult was established. This religion spread through much of northern California. Ceremonies were performed in earthen dance lodges where spirit impersonators would re-enact ancient mythological events. In the Maidu religion, the Sutter Buttes is the place where dying people came to ascend to the afterlife. The Spaniard Gabriel Moraga was the first European to see the Sutter Buttes in 1806. In 1817, the Californio Luis Antonio Argüello named it "los tres picos" (the three peaks, name that appears on the Mexican land grant made to Captain John Sutter). In 1843, John C. Frémont called them "The Three Buttes." James Dwight Dana explored the buttes on 16 Oct. 1841, while part of the United States Exploring Expedition. In June 1846, John C. Frémont, on a massacre spree since April, stopped at the Sutter Buttes. Fearing an attack from the local Indians, Frémont led a preemptive attack which killed many Indians and led the others to flee the area. It remains known as the Sutter Buttes massacre. During the Gold Rush, the Buttes acquired the name Marysville Buttes. In 1920, the state of California failed to purchase the Marysville Buttes, which finally became the Sutter Buttes in 1949. Howel Williams further investigated the geology of the buttes in 1929. Williams teamed up with Garniss Curtis in 1977 to include radiometric dating of the area. In 2003, the California Department of Parks and Recreation purchased 1,784.5 acres (7.2 km²) in Peace Valley on the north side of the Sutter Buttes for $3 million with the intent to develop it as a state park. The land did not have a public access. The California Department of Parks and Recreation lists the park's name as unofficial and its current status as closed to the public as of 2017. This land will continue to sit unused for the foreseeable future. The only access to the property is an easement 20 feet wide running about two miles from North Butte Road. The route crosses private lands and is not suitable for the public to enter. Between 1960 and 1962, the US Air Force built a Titan 1 ICBM missile launch complex at the north side of the Sutter Buttes. A part of the 851st Strategic Missile Squadron headquartered at nearby Beale Air Force Base, the site was designated "851-B." The companion 851-A and 851-C launch sites were located near Lincoln, California and Chico, California. Designed by the United States Army Corps of Engineers to survive a nuclear attack, the Titan 1 complexes were the largest and most hardened of the first-generation ICBM facilities. The sites were composed of three underground missile silos interconnected to support and command bunkers by a network of tunnels. The facility was active between 1962 and 1965. In January 1965, the Titan 1 ICBM was phased out by the US Department of Defense. All missiles were removed from the site by February 1965. The facilities were then decommissioned and the land subsequently sold back into private ownership. The site has been host to many vandals and trespassers since the early 1980s to the present. In September 2016, a US Air Force Lockheed U-2 from the 1st Reconnaissance Squadron crashed in the Sutter Buttes during a training mission, killing one of the two pilots. Before 1960, the land was private but accessible to the public. In 1960, a fire spread on the Buttes and the ranchers decided to close its access to the public. Since the state acquired some of the Buttes, it intends to redevelop its public access but the neighboring ranchers are highly hostile to that idea. Public access to the Sutter Buttes is limited. Almost all of the land is privately held by ranchers and farmers, but an important exception is a 200-acre parcel encompassing most of North Butte, donated by deed from the McClatchy Corporation to the Sutter Buttes Regional Land Trust. The terms of the Deed of Conveyance include the stipulation that the donated land be used for supervised public educational access, not for private use. The deed further stipulates that if these terms of conveyance are violated the land can revert to McClatchy ownership. A few naturalists and local organizations, including Middle Mountain Interpretive Hikes, and the Sutter County Historical Society, lead hikes through some areas. Since 1929, the State of California had considered purchasing the land for protection and a state park. Since 1989, the Middle Mountain Foundation (which outgrew the Sutter Buttes Naturalists) organizes guided hikes in the Sutter Buttes. A monument at the base of the mountains indicating that John C. Fremont camped near here. A close up of the inscription on the memorial. Rock of Gibraltar, Sutter Buttes, California. 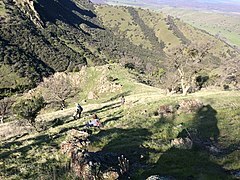 High transect hikers resting while ascending a slope in the Sutter Buttes, California. ^ a b c Stienstra, Tom (2004-03-18). "State buys parcel in Sutter Buttes But public access to Peace Valley could take years". San Francisco Chronicle. p. B-1. Retrieved 2009-05-29. 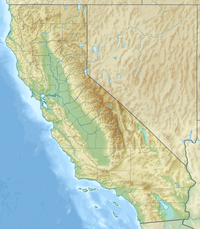 ^ "South Butte, California". Peakbagger.com. Retrieved 2014-02-21. ^ "Yuba City's Sutter Buttes". Archived from the original on 2013-08-01. Retrieved 2014-03-04. ^ a b c d e Hausback, Brian P.; Muffler, L.J. Patrick; Clynne, Michael A. (March 2011). "Sutter Buttes—The Lone Volcano in California's Great Valley" (PDF). U.S. Geological Survey. ^ Johnson, Harry (1943). Marysville Buttes (Sutter Buttes) Gas Field, in Geologic Formations and Economic Development of the Oil and Gas Fields of California. San Francisco: State of California Dept. of Natural Resources Division of Mines, Bulletin 118. p. 610. ^ "Sutter Buttes: Maidu`s Spirit Mountain". California Department of Parks and Recreation. Retrieved 10 February 2017. 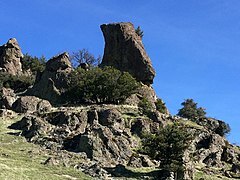 ^ "Sutter Buttes: Maidu's Spirit Mountain". Retrieved 27 September 2017. ^ Frémont, John Charles (1887). Memoirs of My Life, By John Charles Frémont. Chicago: Belford, Clark. ^ "California Department of Parks and Recreation page for Sutter Buttes". Retrieved 2017-02-01. ^ "BEALE AFB". www.siloworld.net. Retrieved 2019-03-31. ^ "Missile Bases, Communication Bunkers, & Underground Properties". missilebases. Retrieved 2019-03-31. ^ "Titan 1". California Cold War Museum & Memorial. Retrieved 2008-12-12. ^ "Sutter Buttes Regional Land Trust - Our History". Retrieved 2015-02-26. ^ "Middle Mountain Interpretive Hikes". Retrieved 2015-02-26. ^ "Sutter County Historical Society". Retrieved 2015-02-26. Allan, Stuart (2005). California Road and Recreation Atlas. Benchmark Maps. p. 64. ISBN 0-929591-80-1. "Sutter Buttes Regional Land Trust". Charles A. Wood; Jürgen Kienle, eds. (1990). Volcanoes of North America. Cambridge University Press. pp. 225–226. ISBN 0-521-43811-X. "Sutter Buttes". Geographic Names Information System. United States Geological Survey. This page was last edited on 31 March 2019, at 02:59 (UTC).